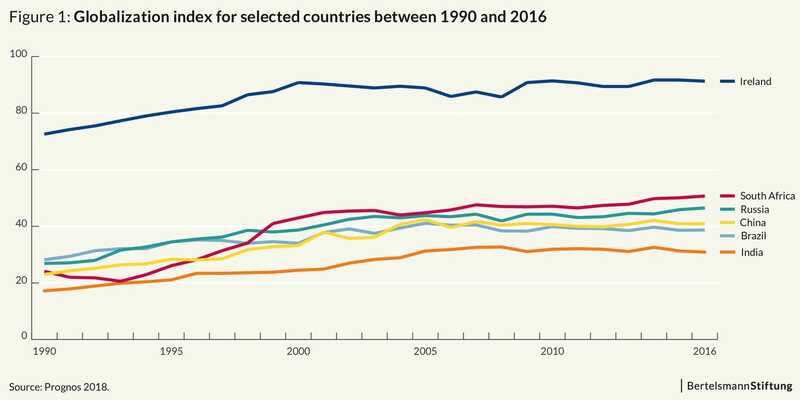 GED Blog » Improving Public Understanding of Economic Globalisation » Globalization Report 2018: What about the BRICS countries? Last week we published our „Globalization Report 2018“ . In terms of real gross domestic product (GDP) per capital, industrialized economies are the biggest winners of increasing globalization. Why are the BRICS countries (Brazil, Russia, India, China and South Africa), some of which are regarded as the engines of globalization, not the main profiteers? This is the question we are looking into in this blog post. The five BRICS countries are among the most populous countries in the world. Together they make up over 40 percent of the world’s population. By comparison, the USA has just about 4.3 percent of the world’s population, and Germany only one percent. The level of economic development is still well below that of industrialized economies such as Germany or the USA. Even Russia and Brazil, which currently reach the highest GDP per capita values of all BRICS countries, only reach one sixth of the corresponding value of the USA (see table 1). How strongly globalized are the BRICS countries? Our globalization index which is closely aligned with the KOF globalization index of the ETH Zurich measures the degree of globalization. The index value is particularly high in small industrialized economies such as Ireland. Emerging countries like China and India occupy places at the bottom of our ranking based on this index. The reasons for this include economic restrictions such as capital controls and trade barriers. Additionally, the economic metrics analyzed are viewed in relation to GDP in each case. As a consequence, for example, China ranks only 38 out of all 42 countries for the indicator “exports of goods in relation to GDP”. How strongly do the BRICS countries benefit from increasing globalization? As we mentioned last week: The average annual gains in real per capita GDP due to globalization are very different among the 42 countries under review: While these increases amount to €1,900 and €1,500 in Switzerland and Japan respectively, they are only at €80 and €20 for China and India respectively. The main reason for this is the low starting level of GDP per capita in the two Asian countries. Between 1990 and 2016, South Africa had the strongest increase of the globalization index of all BRICS countries. The South African index value rose by almost 27 points. In China, the increase was only 18 index points, in Brazil only 10.5 points. Figure 1 shows that South Africa had a very strong increase in globalization relatively early on. Between 1994 and 2000, the value of the globalization index rose by 20 points. As a result, the country was able to achieve GDP growth at a very early stage due to globalization. This brought the country to a higher GDP level early on and therefore generated GDP growth over many years. South Africa already started with a considerably higher GDP per capita level than most of the other BRICS countries. In 1990, real GDP per capita in South Africa was €3,360. In China (€430) and India (€340) the corresponding values were much lower. This also caused a stronger increase in absolute GDP per capita than in the other BRICS countries. 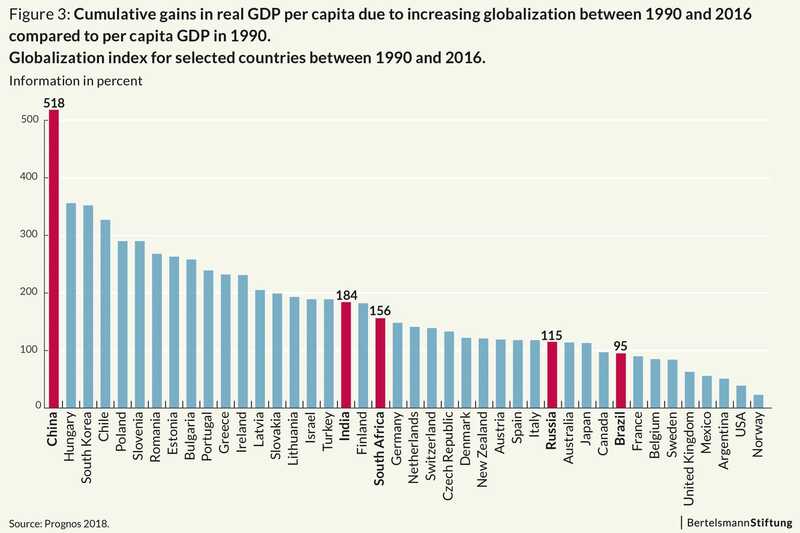 The results look quite different, if we take the annual GDP gains of increasing globalization in relation to the initial level of GDP per capita in 1990. Working with the cumulative GDP gains between 1990 and 2016, China achieves a cumulative per capita GDP increase of €2,050 due to increasing globalization. This accounts for almost 520 percent of the GDP per capita in 1990. This is by far the largest gain of all 42 economies. In Russia and Brazil the cumulative GDP gains reach 115 respectively 95 percent of the initial GDP level. This is still a higher value than for industrialized economies such as France (90 percent), the United Kingdom (about 60 percent) and the USA (about 40 percent, see figure 3). 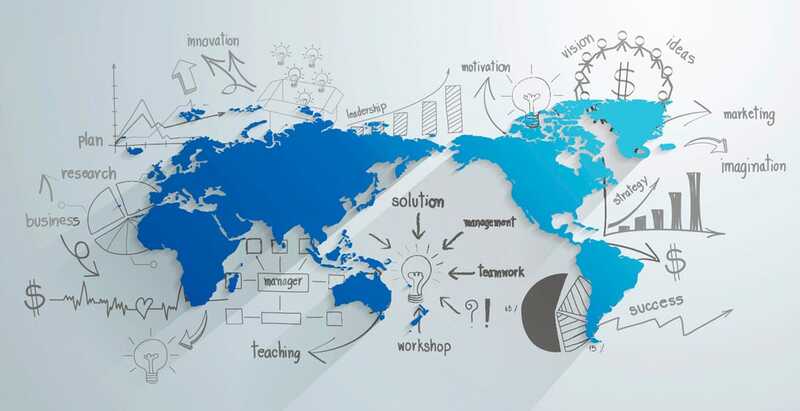 The results of our globalization report show that there is homework to do on both sides: for the industrialized countries and for the BRICS countries. The BRICS countries on the one hand should further reduce their market access barriers in order to push their level of international interconnectedness. In the OECD FDI Regulatory Restrictiveness Index, for example, all BRICS except South Africa rank well below the OECD Average. In the Ease of Doing Business Index of the World Bank, the BRICS also score much worse than the majority of industrialized countries. These kinds of restrictions negatively impact international business activities in and of these countries. Industrialized countries on the other side should continue to cut their subsidies, e.g. in the agricultural sector, which is important for emerging countries such as Brazil. Also, they should actively push their own level of globalization and refrain from protectionist measures such as tariffs, which harm all countries involved. 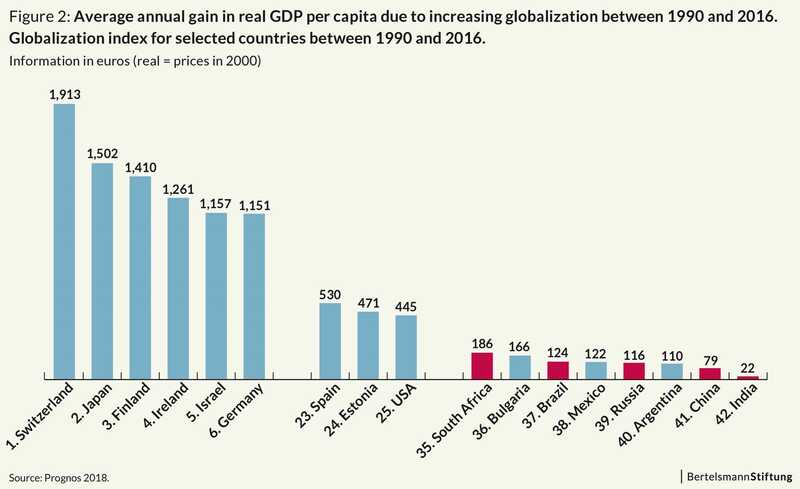 Moreover, the stagnation or decrease of the level of globalization is negative for industrialized countries: The United States, for example, has made virtually no progress in globalization since 1990. Income gains are therefore below average. Opening up to the world and especially emerging markets such as the BRICS would therefore be advantageous for the United States and industrialized countries in general and lead to higher welfare gains from globalization. The gains of globalization have the best chance to be distributed more equally among countries in a multilateral rules-based system. Industrialized and emerging countries should work together to avoid departure from this system but to the contrary strengthen and enhance its underlying institutions, such as the World Trade Organization.